Keeping track of how things are supposed to work at work is hard. Nobody likes getting asked the same question over and over, especially ones that probably have answers buried in Slack or old emails. Socratic attempts to solve this problem. This app allows users to post questions and allows multiple users to answer one question. If a particular answer turns out to be most useful, the person who asked the question can mark this answer with a green check mark. One of the biggest hurdles I faced during this project was implementing the following requirement: You must include a nested form that writes to an associated model through a custom attribute writer. A nested form handles more than one model object at a time. With nested forms, users can submit one form, as opposed to a creating new form for each model object. In my case, I used a nested form that allows users to submit a question and tags on the same form. Because questions can have multiple tags and tags can belong to multiple questions, I created the join table, QuestionTags. You can see how I mapped this has_many :through, along with all the other relationships here. I also added the new custom associated attribute to the permitted params in the QuestionsController. Now, our newly created attribute is on the model’s whitelist of accepted attributes. I also needed to create the associations in the parent model. In this case, I created readers and writers for tag_names in the Question model. 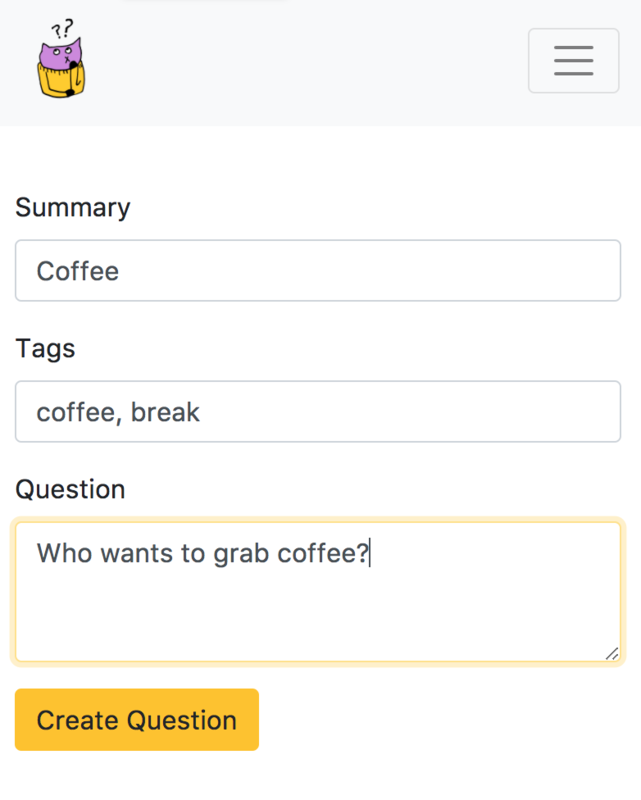 Users can enter tags (i.e., “coffee, break”) and the custom writer will check the database to ensure that duplicate tags are not created through the find_or_initialize_by method. validates_presence_of :content, message: "Empty questions are not virtuous"
validates_presence_of :summary, message: "Brevity is the soul of wit, so summary is required"
My final nested form looks pretty simple, but there was a lot of chin scratching along the way.